Cafe Quaint inside JKK (Jawahar Kala Kendra) is one of those lovely places where you can find some down time amidst Jaipur's maddening crowds. With food so pretty and perfect (oh, those fruity crepes!) and Blue Tokai coffee, you'll definitely find yourself coming back for more during your time in the pink city. 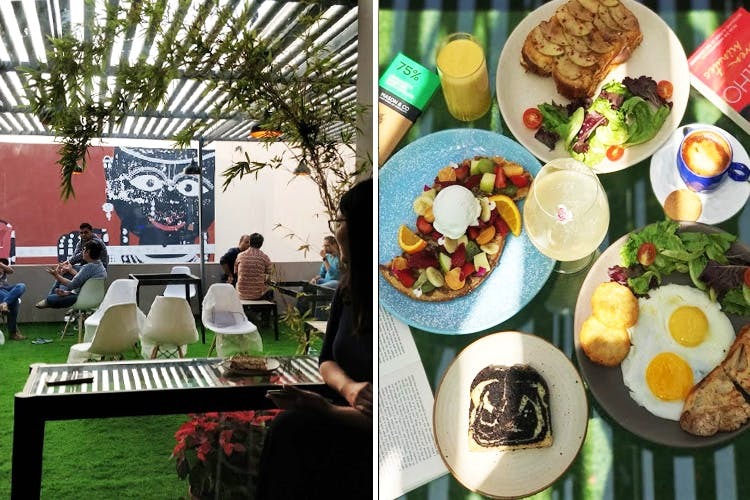 Brunches, Instagram-able and healthy food, quiet time. Started by a banker and a lawyer duo, Cafe Quaint is doing pretty much everything right. For starters, they're located inside JKK, Jaipur's mecca for all art-lovers. Once you've seen all the interesting artworks here and stopped for multiple photo-ops, you can take a break, read, play board games and refuel at this cafe before you get back to ticking things off of your Jaipur bucket list. Coming to the ambience of Cafe Quaint—it's got an indoor area with a bright red wall that carries an ever-changing menu and an outdoor seating area with lots of greenery and sunshine. On a good weather day, we'd definitely grab a seat outdoors with their Turkish Eggs, Coconut Water-Infused Coffee and comforting cakes. Since their menu's seasonal, you can expect a lot of new dishes and a few old favourites (Strawberry Nutella Waffles) too. Fun fact: Cafe Quaint is one of the only few places in Jaipur that serves Blue Tokai Coffee. Also, most of their dishes have edible flowers, which is why they look so perfect. For people who prefer table service, their self-service aspect might be a problem. They'll be hosting a bunch of events like coffee-brewing classes and photography, cloth-printing workshops from September onwards (once the weather gets better), so in case you're around, drop by. Check out their Facebook page for event updates. Also, don't forget to Instagram every inch of this beautiful cafe.